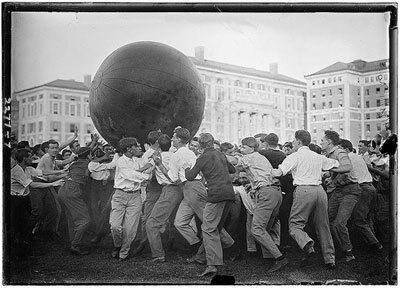 A group of Watson University (then Watson Normal Preparatory Engineering College) students rolls a “crude oil-filled bladder” around in the school’s Freshman Yard, as part of “May Daze” festivities. Depending upon the thickness and durability of the “bladder,” the ritual could go on for two or more hours, until the ball would finally split, soaking the crowd in thick, black oil. The annual event was held until the early 1970s, when rising energy costs, health concerns and impact upon the environment (no grass grows on Freshman Yard to this day) brought into question the ritual’s necessity. Some speculate that the episode of Seinfeld involving the character Kramer’s development of an “oil-filled bladder” was inspired in part by stories of this tradition, as co-writer David Mandel was raised in nearby Feaster Park. Last year the campus chapter of the Sierra Club tried to revive the tradition in an environmentally responsible manner, but was disappointed when the helium-filled bladder simply floated away. My uncle went to Watson, and I remember him telling me about this. Sorry but I just cant think of any thing more ridiculous than a ball filled with Oil…..I laughted ..yet felt an over whelmed concern about the grass not growing ever again,that cant be good? ?